Eindhoven and its tech prowess are starting to get their due in the European media. The FT post – despite its off-topic headline “High-tech hospital R&D focuses on controlling costs ” – is a detailed look at the Medtech coming out of Philips, which has it HQ in Amsterdam, but its R&D at High Tech Campus Eindhoven. That technology includes 3D treatment of liver cancer that dramatically increases survival rates. Henk van Houten, Philips’ chief technology officer and a 34-year veteran with the company, is quoted extensively. It’s a good look at the company that has spun out countless tech companies including ASML and Shapeways. FDI Intelligence’s “Eindhoven uses its Brainport” is a 30,000-foot view of what makes the Brabant region the Netherlands’ No. 3 economic driver behind the Randstad and one of the wealthiest provinces in Europe measured by GDP. While Amsterdam and Rotterdam generate wealth through more conventional sectors such as logistics/ports, insurance, banking and corporate headquarters, the FDI Intelligence post notes that Brainport Eindhoven is the high-tech engine responsible for 20 percent of the total private R&D in the Netherlands. The Eindhoven city-region accounts for about half of all patent applications in the Netherlands. The article never defines “Brainport,” and the sobriquet is a bit vague. We’ve been told it’s the region within 40 miles of Eindhoven, which would include ‘s-Hertogenbosch and Tilburg. • High Tech Campus Eindhoven, where Philips, ASML, NXP and maybe 145 other companies have operations, and where 12,000 people work. 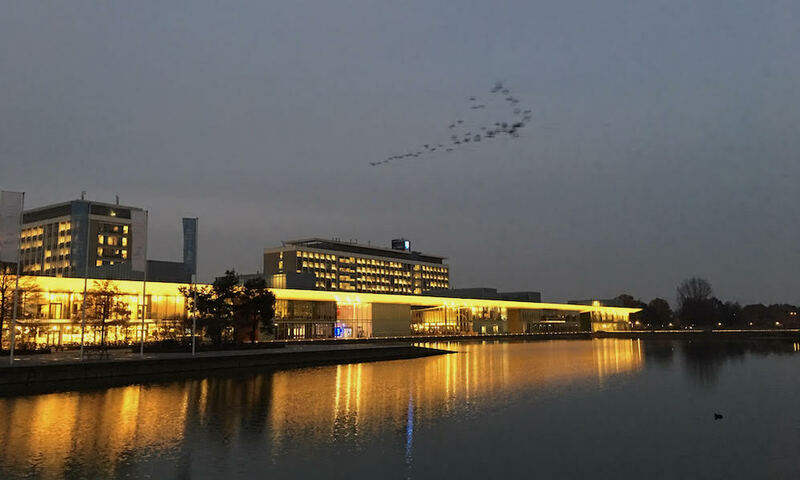 • The new Brainport Industrial Campus. • Technical University of Eindhoven. The post even has stuff we didn’t know, including details including a number on the ongoing revitalization around centrum. The city plans to invest, alongside developers and investors, €5bn in urban development projects in the next five years. Among the signature schemes, ‘Eindhoven XL’ is a zone covering 55,000 square metres in the city centre, next to the central railway station, designed as a place for 20,000 people to live, work and play. There are a couple of “huhs?” including noting that “some” call Strip-S “Little Berlin.” What? But hey … as they say in America, there’s no such thing as bad publicity. Especially when it reaches 190,000 readers per day. We got a couple of interesting emails from the organizers of New Dutch Wave, which both hosts American tech players here in the Netherlands, and takes Dutch startups to Austin, Texas for South by Southwest, one of the biggest big-name tech/creative conferences in the United States. Are you a start-up, scale-up or a small- or medium sized company and ready to enter the American market? If the answer is “yes,” you need to know about New Dutch Wave and their connections to Austin, and more specifically to South by Southwest. The RVO has a special subsidy where vouchers are provided to SMEs, scale-ups and start-ups who join New Dutch Wave. This means that they can be reimbursed up to 50% of their costs from their presentation at the New Dutch Wave exhibition stand during SXSW, up to a maximum of € 1500. For startups this means max. € 975 for the NDW start-up package of € 1950 and for scale-ups and small and medium-sized companies up to a max. of € 1500 for an NDW package of € 5000 and € 15.000. Prior to the festival, New Dutch Wave organizes a meeting where the participants will be prepared for their presentation with, among other things, a special pitch training. The application deadline is 4 February, and travel, accommodation costs and conference tickets are not included. So, go! And don’t forget your 10-gallon hat. You’ll fit right in. Want to understand why the Netherlands has such a successful economy? It’s because this country attracts so much talent. Witness HighTechXL’s second Give Back Monday event on 21 January, the first in the new offices in the new High Tech Plaza startup hub and first of 2019. Despite frigid temps across the Netherlands, a total of 12 people representing 8 teams turned up. Yabbu – Christian Zierleyn has developed an app to make meetings more fun, efficient and productive. Fabber – Gustavio Goulart has developed a professional large-format desktop 3D printer that allows designers to be their own rapid prototyping jobber. Habel – Tom Kersten is part of a team that started at Technical University of Eindhoven. Habel is developing speech-to-text technology that allows vision-impaired people to use smartphonesphones. CADchain: Denis Khristolyubov and Violetta Shishkina from Russia are creating technology that combines CAD and blockchain so that designers’ and engineers’ creations don’t see their original work integrated into other company’s products without payment. Musi-co: Valentijn Borghuis developed Musica Combinatoria (Musico for short), AI technology that creates open-source music. Whoadvisor: Emrah Senel and Chelsy Duarte have developed a digital advisory that lets you locate specialists in multiple categories including health and law anywhere in the world. Umital – Britt Claessens and Eline Grouwels have a consulting firm that helps clients future-proof their companies by making sure employees understand and adopt the latest digital technologies. ZENeSYS – Saibal Sen has developed ZENeSYS, a unified services platform to serve Fortune 1000 IT clients with new-technology supply-chain procurement, product development, automation and process improvement. ZENeSYS has operations in India, Netherlands and Boston. The next Give Back Monday isn’t scheduled yet, but the plan is to host them every two months. If you’re interested, don’t hesitate to ping us any time. HighTechXL’s first open-door outreach to startups in November 2018 attracted 16 people representing 10 startup teams needing advice and encouragement. The format is pretty simple: Teams are free to bounce ideas and brainstorm with expert pools to get detailed feedback about where you are in the process of building your company. Roundtables are set up with experts on finance, IP, team building, business plans and other topics, and teams rotate through the evening. Speaking of HighTechXL, the Netherlands’ premier deep-tech accelerator still needs talent for its CERN teams taking futuristic technology to market. You can see details about what each team is doing here. • Dynaxion Security uses CERN proton accelerator technology for more detailed scans than X-rays, with applications in detecting prohibited and dangerous materials in packages, luggage at airports and freight passing through shipping ports. • Dynaxion Agro uses CERN small linear accelerator to analyze soil for the most efficient and productive agriculture methods. • Microspot Communications use CERN’s laser technology to create next-generation communications connections. • Microspot Metrology uses CERN’s laser technology for more efficient alignment of equipment used in photolithography in the semiconductor industry. • InCooling uses CERN’s CO2 technology to cool computer processors, saving energy and increasing efficiency. For more information, ping us at: cheryl@dispatcheseurope. For all us newbies, our first glimpse of the Evoluon is always confounding: So, Eindhoven has a flying saucer that’s landed in the middle of the city? The building dates back to 1966, built by Philips as a futuristic events and conference space. HighTechXL had its demo day there last year, and we’ve been to the Evoluon for many, many meetings. We thought it was kind of retro cool but totally underutilized. While it’s quite nice and open inside, time has kind of passed it by. Some city leaders thought the Evoluon needed to be replaced with … something. Then there was a plan to turn it into a national tech museum. But developer Foolen & Reijs ended up acquiring the property from Philips. There are plans to redevelop what is a pretty sizeable parcel, adding offices, a hotel, short-stay apartments and a restaurant/caterer. And, of course, even in Eindhoven, there are people who think all change is bad, so there’s a petition to stop the project. • We’re planning the next TechTrek, and we can reveal this … it’s going to be ambitious. Working with Eindhoven Airport, our first TechTrek flew in entrepreneurs from Lisbon and Rome to experience Eindhoven’s ecosystem. Stay tuned for details soon as TT2 comes together. • Don’t miss the next Drinks, Pitches & Demos coming up Wednesday, 6 February. This first tech meetup of 2019 will be at TU/e’s Innovation Space, not at Building 12 on High Tech Campus. DP&D goes from 5 p.m. till everyone has to go home. Make a note, and we’ll see you there! • TravelTech is the Next Big Thing. There’s probably no other business sector that benefits from digital, whether you’re talking about finding a hotel online with Amsterdam-based Booking.com or finding your way with Berlin-based GoEuro. Now, there are multiple Eindhoven-based efforts to customize your travel experience. Maps Untold members – all students at TU/e – were in Finland recently for Slush, and they’re already getting approached by major tech companies and accelerators. Maps Untold’s secret sauce is using AI for travel searches. The team is now trying to decide between going to consumers, or becoming a B2C, working with travel agents. Nick Nedelchuck is working on Localie, an app that will connect travelers to people in other countries who speak their language. • The Eindhoven medical equipment startup and HighTechXL alum Usono has found investors at MSB de Medici, the partnership of independent medical specialists working mainly in the Máxima Medical Center here in Eindhoven. • GrAI Matter Labs is a new tenant in High Tech Campus’ new startup hub. GrAI Matter is developing “ultra-low power, fully programmable neuromorphic computing for sensor analytics and machine learning – powered by brain-inspired technology,” according to their website. We had to look up “neuromorphic” … it means electric circuits that mimic the brain’s neural networks. Wow.